Without hard drive recovery services, data storage system failures can take entire organizations down. TTR Data Recovery's experts empower companies and consumers to bounce back even though all hope seems lost. The data on your hard drive is invaluable. Whether it be important business information, confidential files or timeless family photos the thought of losing it all can be overwhelming. Thankfully data recovery services like ours can recover your valuable personal or professional data. We can retrieve data regardless of whether the data loss was caused by hard drive corruption or physical issues. Our dedicated Hard drive data recovery specialists make it their business to know the fundamentals of all hard drive brands and models. By staying informed and up-to-date on logical, mechanical and other failure modes, we’re able to respond to disasters with HDD recovery services that get you back up and running without a moment’s delay. What’s more, our expertise and ISO-compliant facilities mean that you can recover your data and start moving forward like nothing ever went wrong. Don’t stand for losses that might knock you out of commission for good. Discover why everyone from industry leaders to government officials trusts TTR’s hard drive data recovery services when everything is on the line. Schedule an HDD pickup today. Hard drives organize data around various schemes that help them make the most of storage space and avoid errors. If your computer can’t recognize the way your drive arranges its data due to recording mistakes, corruption or similar problems, you won’t be able to access the information. One way to fix the issue is to use software. However, there is an extent to which consumer level, commercial software can recover data. At times it can end up doing more harm than good. Professional hard disk data recovery services will first determine the extent of the problem and then use the right method to recover data. All steps taken ensures that there is no data loss. Modern Platter based Hard disks contain an army of components. The failure of any single part due to shock, control problems or other damage could compromise the entire device. The cost to retrieve data from hard drive with this failure varies mainly on the extent of the damage. As experts, it is our job to disassemble the hard drive, fix or replace the component, and then recover data. For your emergency needs call 888.328.2887! In most cases, mechanical failures require complete drive disassembly and data transfer in certified clean-room environments. Our uniquely designed, high tech clean rooms improve data recovery chances by up to 99%. Your data may have been erased due to an operator oversight, or your software may have made the mistake. Usually, it is an honest mistake which can lead to a great deal of frustration especially since most consumer-level data recovery software can’t help. While it does not hurt to try a few to see if it helps to recover your files, it will cost you both time and money. While not as common as other failure modes, deletion requires just as much forensic skill to recover data. Our data recovery service successfully retrieves deleted data regardless of if it was operator error or caused by a piece of software. 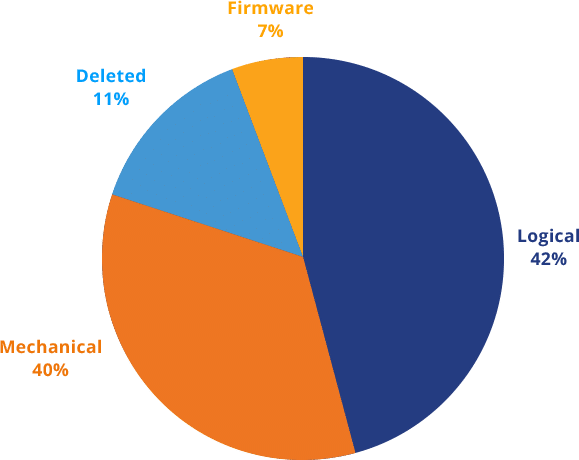 While modern hard drive manufacturing has all but nearly eliminated instances of firmware failure, it still does happen. Our hard disk recovery service has the expertise to deal with firmware related errors which can make it impossible to access data on the hard drive. Effective solutions depend on advanced diagnostics and intelligent repairs. Repairing a hard drive with firmware failure takes a high degree of expertise and experience because one wrong move can cause all your data to become unrecoverable. That’s why it is so important to contact us as soon as you experience firmware related issues with your hard drive. What happens if HDD Fails? In most cases, a hard drive failure is followed by the computer crashing if it’s your primary drive. You will not be able to boot in your operating system. It can be hard to tell the difference between logical and physical failure as the errors are the same. However, if you hear clicking, whirring or grinding noises, it is almost certainly a physical failure. So, the hard drive disk recovery process will entail finding what’s wrong with the drive physically and then recovering data from it. What are the signs of HDD failure? One of the most common signs is your computer will not boot into the operating system. You will also hear strange noises from the hard disk. However, if the logic board has burnt out for some reason then the hard drive will be silent, i.e., you won’t hear anything. Also, the bios will not be able to detect the hard drive. How do you fix a hard drive failure? Our approach to disk drive recovery varies depending on the issue. If it’s a physical issue like stuck platters, broken heads, etc. then those issues are fixed by disassembling the drive, and installing identical heads or unsticking the platters. All of this is done in a clean room after which we start recovering data from the drive when it starts working. If it’s a firmware or logical failure, it usually entails figuring out which one it is. We then use highly specialized software to fix those issues just so that the hard drive is good enough for us to recover data. Yes! It is possible to recover files from a failed platter-based hard drive. However, it becomes more challenging if those files have been overwritten. Hard drives recovery, for the most part, requires that the drive is put into a semi-working state which allows us to recover data from it. How much time does crashed hard drive recovery take? It depends on the nature of the failure. If the fault is physical, it can be relatively easier to recover data from it which means that its quicker than if it was some other issue. However, some physical failures like those of the head or platters can be more complicated to fix and recover data. If your hard drive data recovery plan isn’t agile, then it probably isn’t worth the trouble. TTR Data Recovery’s streamlined process is the ideal solution for those who need dependable information retrieval without a second to lose. Talk to us today – 888.328.2887! You never pay for shipping or failed recovery, so getting information back is more cost-effective. We respect your urgency, so we don't take weekends or holidays off. You can set things in motion faster with near-instantaneous diagnostics and same-day recovery. Our hard drive recovery process keeps going until we've succeeded. Hard Disk Data recovery demands trustworthy, secure methodologies. TTR maintains ISO 9001 certified quality management systems that ensure we continually meet SOC type II security protocols. No matter how irretrievable your data seems, you can rely on us to restore it safely and help your organization stay compliant in the process. Looking for Emergency Hard Drive Recovery Service? Want to tell whether a recovery provider is worth your time? Unlike in some fields, it’s easy to gauge your options simply by checking out each company’s track record. Our expertise is known throughout the industry, but you don’t have to be an insider to appreciate the difference. Here are a few stats that demonstrate just how good TTR Data Recovery is. We’ve helped companies, private individuals, nonprofits and government agencies retrieve a massive quantity of seemingly-lost information. Even better, we continuously do so faster than our competitors can. We’ve rendered SSS data recovery service to owners thought they had become impenetrable black boxes. Whereas some recovery providers might balk at the prospect of dealing with so much complex hardware, our cleanrooms let us revel in the challenge. Different data loss events call for diverse information retrieval tactics. Failing to apply the right techniques in a given situation can actually make the problems worse. Recovering hard drive data from desktop computers can be tricky. These problems don’t always have clear causes or easy solutions. Our PC and Mac data recovery professionals use their vast skills and clean room expertise to get your information back no matter how dead your system may appear. Want to get data back from a crashed laptop? You’ll need careful, precise techniques to avoid doing further damage. Our team has the diagnostic tools and extraction experience to extricate information from the most fragile, finicky systems. SSD data recovery service demands a completely different style of approach than HDD recovery does. 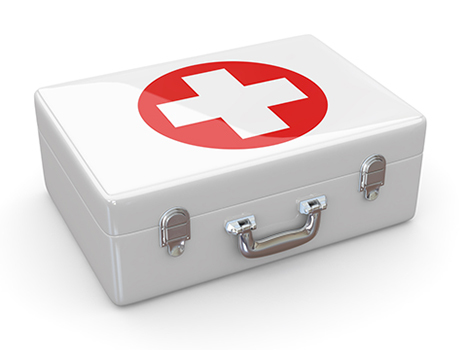 Is your loss-mitigation plan sufficiently prepared? This technology may be comparatively newer, but fortunately, we’ve got the experience, cleanroom facilities and manufacturer ties required to extract your data. External HDDs may look simple, but they’re more than just shells with USB ports. We’re well-versed in the nuances of different hardware, so proprietary devices are no challenge to our technicians. Relying on our hard drive data recovery practices maximizes the chances of retrieving your information without compromising its integrity. Data losses typically mean economic sacrifices, but we don’t think you should have to completely lose sight of the bottom line to get back in business. Our hard drive data recovery services are designed to minimize fees and eliminate mistakes so that you only pay for what you need. Unlike firms that charge you just for diagnostics, we make it simple to stay in the know and choose the most effective recovery options. From journaling to RAID recovery services, different operating systems use several techniques to store your digital information. TTR hard drive data recovery services adapt to the unique challenges posed by various OSes so that you can access your information no matter where or how it’s stored. Why join the thousands that count on TTR Data Recovery Service? Our vast client base reflects our widespread industry connections. We’re trusted precisely because we’ve built strong ties with names you already depend on. Since we work closely with hard drive manufacturers, we have unparalleled expertise on how to solve problems specific to their hardware. TTR Data Recovery supports and partners with all hard drive brands. We’re the most certified service provider in the US. Hard drive data losses can easily catch you by surprise and test the limits of your patience. For instance, do you know what to do when an HDD fails or how to recognize the signs that something’s about to go severely wrong? If your drive has already failed, are you confident that you can fix it or recover the files it contained? By making TTR hard drive data recovery services a part of your response plan, you can answer these questions with confidence. Check out our service area for more! Operating systems pose no barriers for TTR Data Recovery technicians. 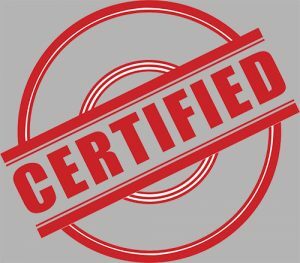 Our Apple Certified Mac Technicians (ACMTs) know how to traverse Mac OS filesystems and retrieve your data along the way. Could yours be next? Bleeding-edge technology lets us recover vital data for Microsoft Windows users no matter which operating system versions they favor. Our Linux support covers all distros, enabling us to beat logical errors, corruption, and other problems that keep you from your data. Hard drives are also known as hard disks because the platters they employ are disc-shaped. Each platter is coated in a special thin film of magnetic material whose field can be flipped when an external magnetic field is applied. This film is further divided into separate segments that each store a single bit of data. This is similar to what happens when you bring a magnet near a piece of iron. The iron will pick up a slight magnetic orientation as its field is realigned by the magnet’s field. In the case of a hard disk, the read-write head mounted on the moving read-write arm applies the field to write a bit. It can also read the orientation of a previously-written bit’s field to retrieve data. How does a swiveling arm reach all the areas on a round disc to fill it with information? The platters spin in place at high speeds that are well upwards of 4,500 rotations per minute. This permits the arm’s read and write heads to access different parts of the platter and perform operations extremely rapidly. 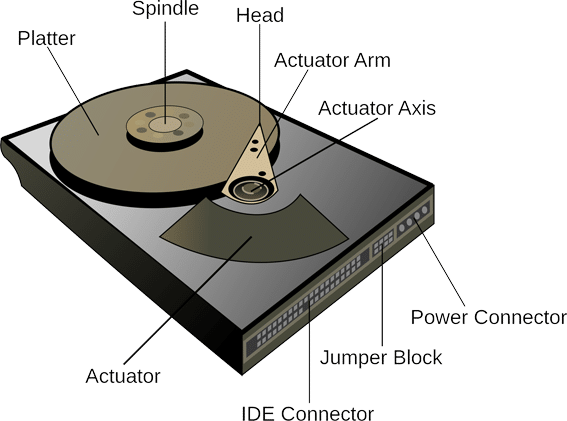 What Are The Parts in a Hard Disk Drive? Your time is precious, and so is the data on your hard disk. Our state-of-the-art facilities, coupled with some of the most seasoned experts will work to recover data from your failed hard drive. The industry-leading technology and techniques used at your facilities ensure that there is no hard drive we can’t retrieve data from and that too in the shortest time possible. That way you suffer from relatively minimum downtime caused by data loss. Our goal is to help you get up and running in no time. Contact us for professional hard drive recovery today! When our server failed I knew the only company to call was TTR Data Recovery. We have used them a couple of times in the past, and many of our employees have also used them for personal data recovery needs. As always, our server was back up and running in no time and we were back in business 4 days later as if nothing had happened. Thank you again TTR! TTR was the only company that I felt comfortable with the pricing and security standards, and was impressed with their customer service and transparency. I shipped my hard drive to their lab and received a free evaluation report the next day. I said go for it, and in 5 days I had all of my files back. I can’t even stress enough how much I owe this company. I can’t thank them enough, and based on my experience, I would definitely say anyone with a failed hard drive should call TTR right away. I want to express my sincere thanks to the team of technicians who worked to recover the data on our RAID 0 set. Given the errors we initially saw, we had our doubts that the file could be recovered. Our project was very happy your team of technicians was able to recover the entire RAID. Please let your team know their efforts contributed to the success of our project. I would like to offer my sincere thanks for the work done by TTR Data Recovery. I’m happy to say the customer service was excellent and all of my data has been recovered. I can’t thank your company enough and will recommend everyone to you. My flash drive malfunctioned and appeared completely “dead.” TTR was able to satisfactorily produce the full list of files, including the one critical file that I was particularly interested in.